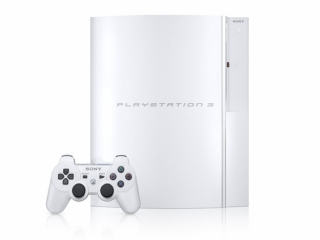 The 40GB white PS3 is lighter and quieter, but has had a lot taken out. This weekend marked the end of the PlayStation 3's first year on sale and to mark the occasion Sony Japan released the 40GB white PS3 we told you about last month. The ¥39,980 (£168) console not only brings a different colour to the party, but it is also slightly different from its predecessors. The changes we already knew about have indeed been implemented - these include the loss of the memory card reader, SACD support, two of the USB ports and PS2 compatibility. What was only rumoured, however, is that the 40GB PS3 is 600g lighter at 4.4kg, that the new 65nm CPU means it consumes less power than the older models - about 30W less on average - and that it is significantly quieter in operation. Saving a few decibels could make a difference to anyone using the PS3's Blu-ray drive as part of a home-theatre set-up, but gamers will be hard-pressed to tell the difference. As ever, there's still no word of a UK launch for the white console.